There wasn't really any interaction between Merlin/Arthur this week, but that's okay because every other pairing got its chance to shine! - If you execute Gwen's father, I will never forgive you. Never! - You have blood on your hands, Uther Pendragon. Blood that will never wash off! - May I remind you that you're speaking to your king? - May I remind you that a king is wise and just? You are neither.You rule only with a sword. - You know nothing of what it means to be king. The fate of this kingdom is in my hands. It's my responsibility to protect the people in this land from its enemies. - Then the kingdom is doomed! One by one you make enemies of us all. 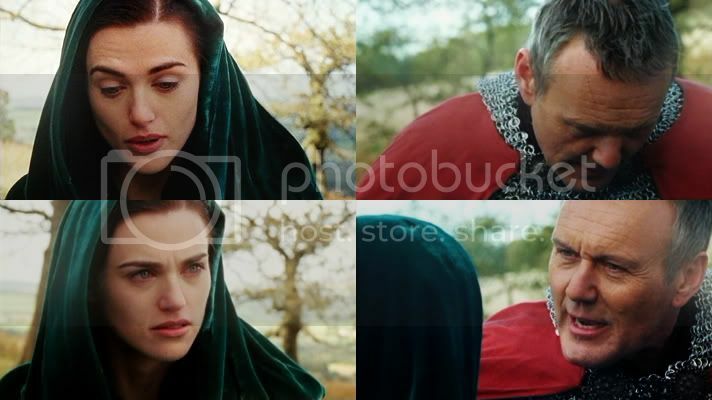 - You speak treason, Morgana. - Only a mad man hears the truth as treason. - Take care, child, or I'll have you restrained. 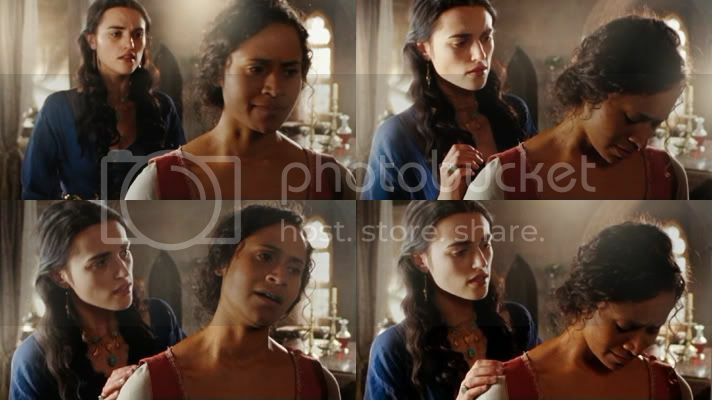 *cut to Morgana being restrained* haha, she did not see that coming! - And you will remain here until you learned your lesson. - Then release me, 'cause I learned it already! That you care not for me, or anyone but yourself! That you're driven mad with power, that you're a tyrant! Oh noes, Morgana's angry and plots to kill the king! - You wish to say something? - I came to apologize, my lord. - I didn't mean to rile you. I thought only of Gwen. Poor girl's all alone in the world. - Not my intention to hurt your maid. - I know. But now she suffers. I know what she must...I know what it's like to lose a father. - ...That was a terrible day. Your father was a great friend. I had no part in his death! - You send him into battle! You promised him reinforcements, and then give him none. You send him to his death. - But it happened! And it keeps on happening! - I'm sorry, my lord. - I cannot tell you how much it pains me to be at odds with you. - And I with you. - I've been thinking about what you said, and I realise...I may have been insensitive. I should have foreseen the great stress your maid's loss would cause you.That it would stir old memories. I've opened an old wound, and for that I'm sorry. - My lord, it gladdens my heart to hear these words. I, too, wish to heal these wounds. Let us visit my father's grave together, and put the past behind us. DUN DUN DUN it's a trap! - When your father died, I lost the best friend I ever had. For he was a fearless in questioning my judgement as he was in defending my kingdom. That's the mark of a true friend. - I know how he respected you, my lord, but I don't share these memories. How can I? I was ten years old. I only know I loved him and he was taken from me. - When he died and I took you into my care, you fought me from the beginning. Your will is as strong as my own. You challenge me as a friend must. As your father did in his time. - I know I'm not an easy man. My temper blinds me sometimes. There are things that I regret. - ... are you saying you were wrong to have Tom killed? - I will strive to quarrel with you less, and listen to you more. You've been a blessing to me, Morgana. You are the daughter I never had. Your counsel is invaluable, as is your friendship. Without you, I cannot hope to be the king this land deservers. Please forgive me, Morgana. Basically this whole episode was about Gwen/Morgana, no? 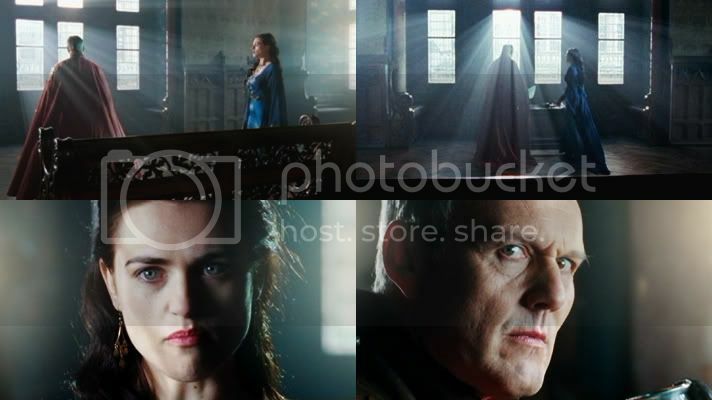 You hurt Gwen, you'll have to deal with Morgana!
" I thought only of Gwen." " Morgana's been amazing these last few days." - You shouldn't have to done that, not on my behalf. If anything happened to you, I couldn't bear it! I loved this scene because it was so very awkward! Arthur was clearly nervous and Gwen was sort of looking like she didn't know what was going on. But Arthur didn't have to do this, but did so anyway, and Gwen was grateful for that. - I know that, under the circumstances, it's not much, but... Anything you want, anything you need... All you have to is ask. - You. How proud you must be. Son of the mighty Uther. How proud you must be! Has the king's little helper come to bring a message or have you just come to gloat? - You're free to go. Morgana, I swore to him you'd never challenge his authority again. That you've learned your lesson. Tread carefully, next time I may not be able to help you again. - Thank you. You're a better man than your father. Always were. 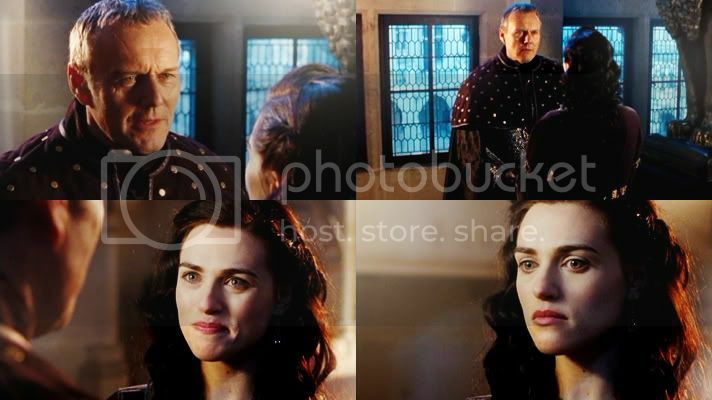 - Uther had already made up his mind. That's the kind of man he is. - I wouldn't blame you if you wanted him dead. 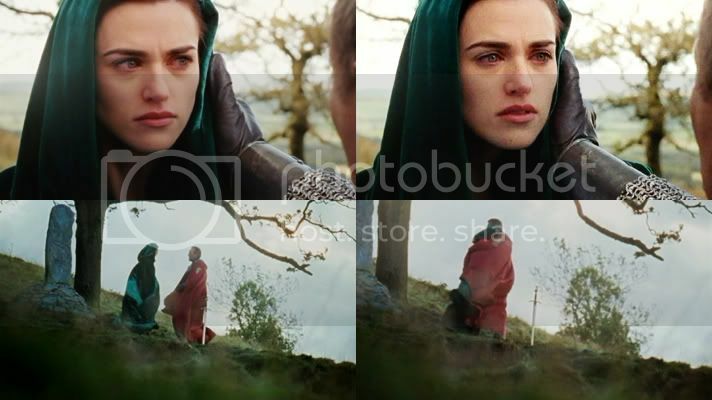 - If Uther died I'd feel nothing. He means nothing to me. - If you had the choice, what would you do? If you hade the power of life or death over Uther, would you kill him? For what he did? - What would that solve?! That would make me a murderer! That would make me as bad as him! 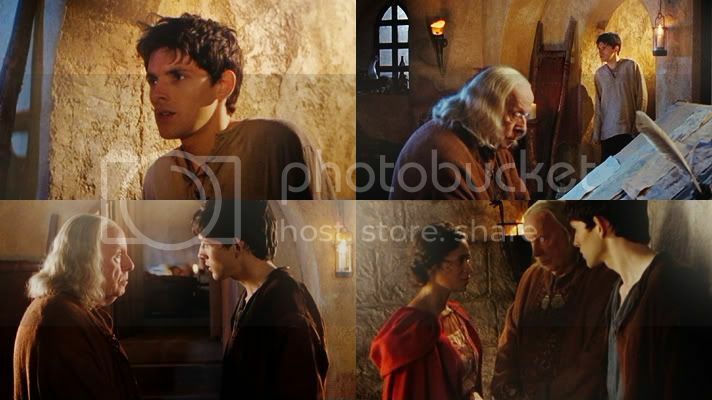 Okay, they didn't interact that much this episode, but it seems to me like Merlin didn't have as much a problem with Uther being dead as he did with Morgana becoming a murderer. God, these two just kill me in every scene they're in together. Even the "obligatory exposition" ones. 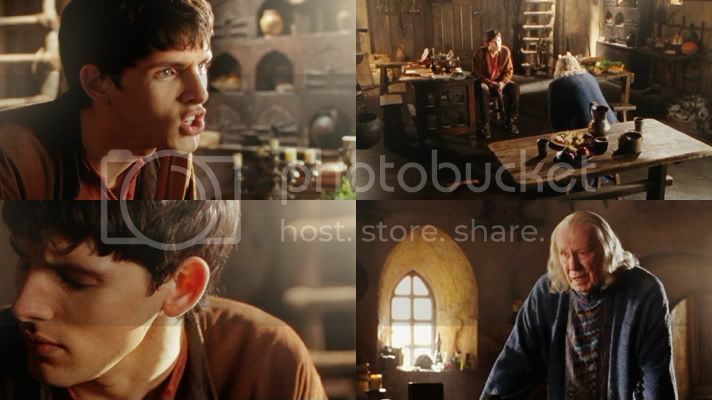 As much as I love and obsess over Arthur/Merlin, it's Merlin/Gaius I need every week. 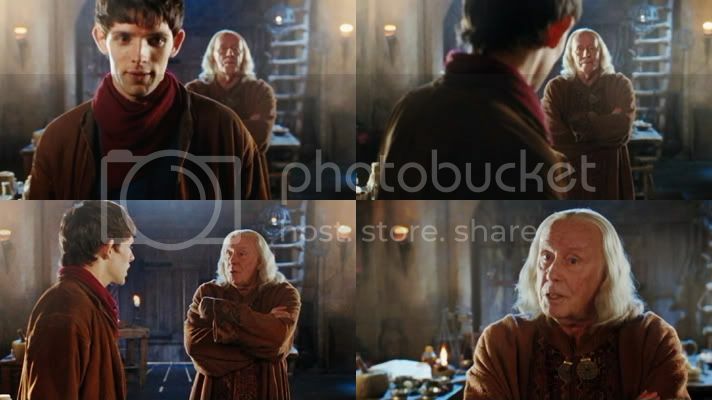 I would totally watch a show of "the wacky adventures of Gaius and Merlin". 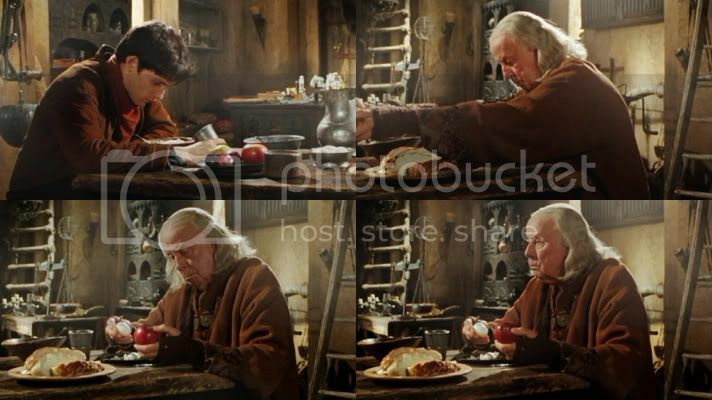 If something happened to Gaius, I would be devastated. Bedhead!Merlin is my favourite kind of Merlin. - Oh dear, I'm going to have to tell him about what happens when young boys become men, won't I. - Pass the salt, please. 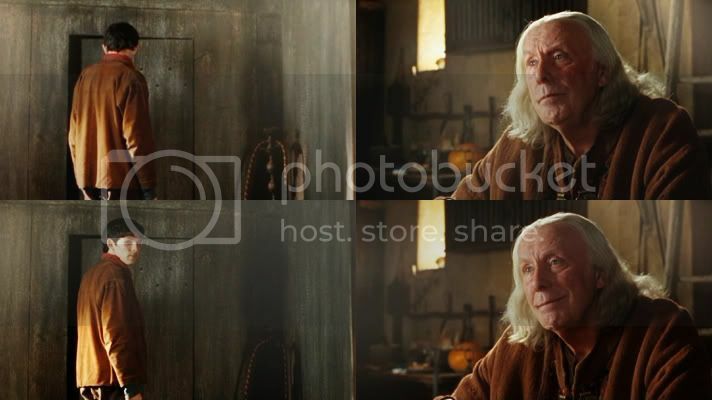 - eh...Merlin? That's a broom cupboard. Oh, show. You have no problem going with the most obvious joke, do you? I see them coming from miles away, and yet I'm still laughing. Just look at their cute little faces. Hee. When Merlin needs advice, he goes to the Slash Dragon. When he needs advice about the Slash Dragon's advice, he goes to Gaius. 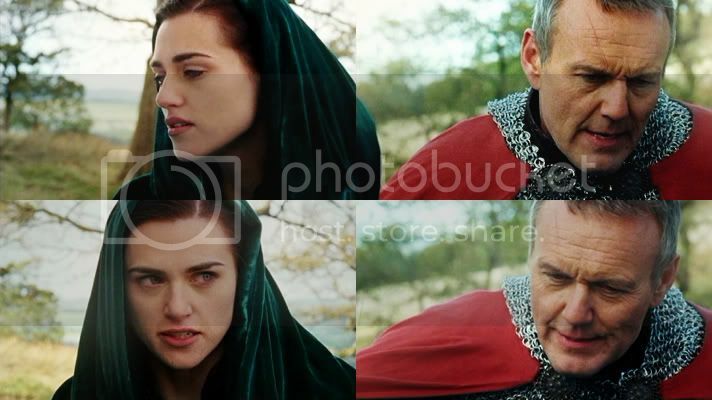 - It is not Uther's job to be liked, it's his job to protect this kingdom. 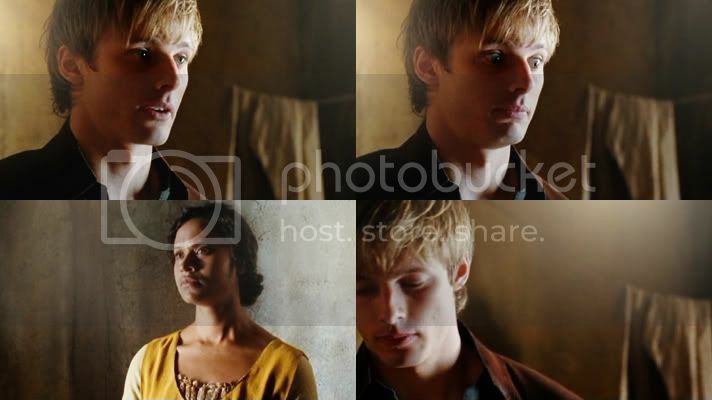 Oh yeah, unexpected Gaius/Uther! - Is there something you want to tell me? 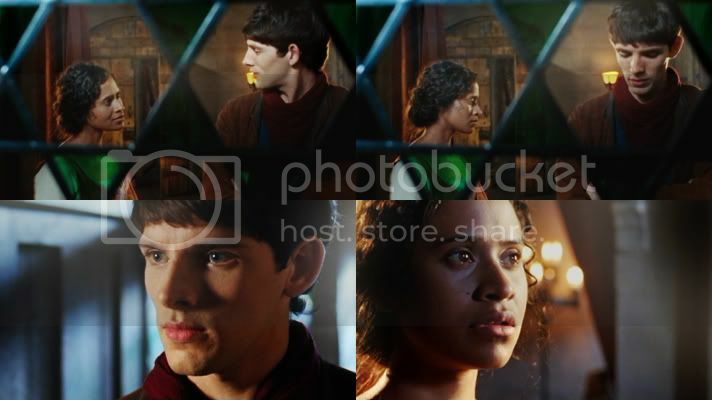 - I do trust you, Merlin. Whatever it is, I'm sure you'll do the right thing. - How many men were there? Three, maybe four? - Yeah, something like that. 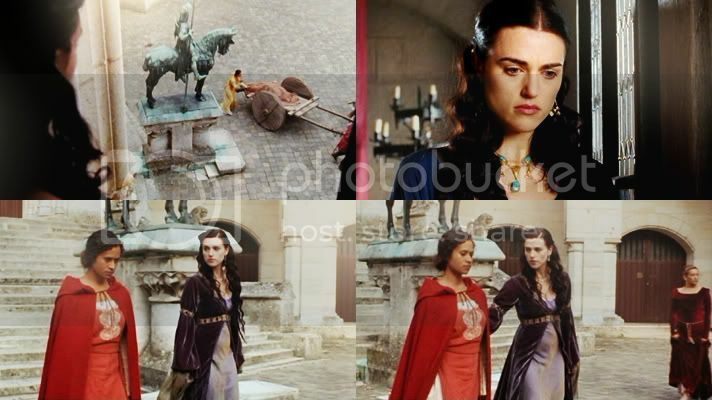 - Morgana must've shown so much courage to defend the king against such odds. I suppose you had nothing to do with it? - Oh, you know, just...background stuff. 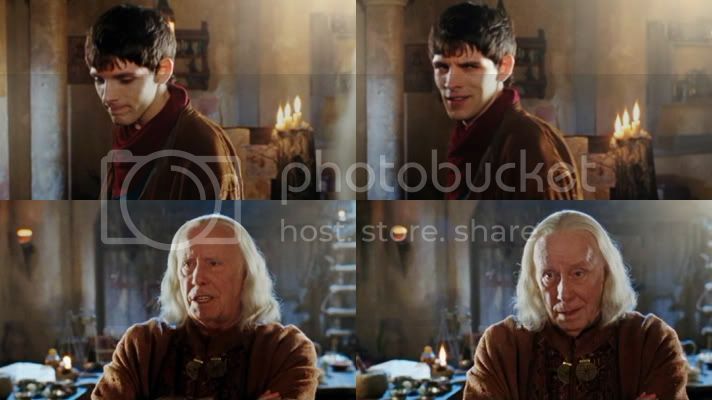 - No need to be so modest, Merlin! - It's not a criticism, it's a compliment! WOW This turned out to be long.